Texus Fibre chief executive Nick Davenport and director Andy Ramsden with the new wool filters. Texus Fibre uses natural wool to develop 'functional materials' - meaning they do something clever scientifically. On Thursday it announced an investment and distribution deal with Auckland firm Healthy Breath Limited (HBL) for Texus' wool-based air filter to be used in face masks marketed to city-dwellers in Asia. Helix Filters harness and enhance wool's natural toxin remove properties to stay drier and work for longer, Texus ceo Nick Davenport said, making it easier for people to breath in the masks and making them more effective at blocking out pollution. According to the World Health Organisation, poor air quality claims seven million lives each year, with urban air pollution accounting for four million. Consumers in countries such as India and China spend almost $3 billion on face masks each year - with double-digit sales growth annually. ​"At the very heart of this is a New Zealand story, that of high-country sheep producing the world's greatest natural fibre," Davenport said. "We've created something unique – an end-to-end supply chain which starts by getting the supply genetics right and goes right through to the manufacture of a high-value, scientifically verified product here in New Zealand." "Through this deal New Zealand wool is going to improve the health of millions of people across the planet. In so doing, Texus Fibre and Healthy Breath want to recognise the commitment of New Zealand's sheep farmers by paying them a premium for what is, in all reality, an absolutely premium product – wool." Aug. 26 (BusinessDesk) - Agritech start-up Biolumic, which increases crop yields by applying ultraviolet (UV) light to seeds, seedlings, and plants, is also treating them for resistance to pests and disease. 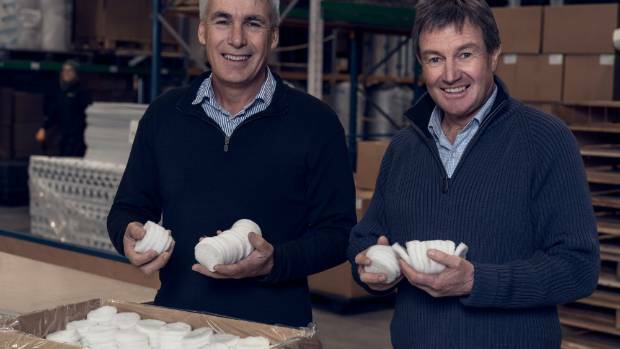 The Palmerston North-based company was founded in 2012 by chief scientific officer Jason Wargent, who is a Massey University-based world expert on the effect of light on plant growth and development. He initially investigated whether the hole in the ozone layer was damaging plant growth and instead found increased UV levels were beneficial. Early trials in New Zealand on lettuce and basil plants showed promising gains by having specific “recipes” of UV light shone on them to make them hardier and grow bigger. Biolumic’s game-changing Smart Light Array Technology releases varying quantities of UV light at different wavelengths. Successful trials last year on lettuce and broccoli for one of California’s largest salad grower, where yields increased an average 10 percent, led to the company becoming Biolumic’s first paying customer this year with 35 million seedlings being treated. Biolumic’s business model is to have recurring revenue based on installing equipment onsite and charging a per-plant treatment fee, with the US and Mexico the initial target markets, followed by Europe. “We’ve been able to show that customers will get a significant return with a payback of $2 for every $1 spent with Biolumic,” said chief executive Warren Bebb. The start-up has also moved beyond treating leafy vegetables to trials of treating seeds of corn in New Zealand this year which have produced similar good results. “There has been the same consistent reaction to seeds as treating seedlings and we didn’t expect that,” Bebb said. Further seed trials are planned in New Zealand from November and then in the northern hemisphere next year. Prime targets for the seed treatment are row crops such as corn, soy, and wheat. A third leg under development is treating the plants for pest and diseases resistance by using a slightly different ultra-violet light and would do away with the need for pesticides. Bebb said its two UV treatments could be combined or kept separate though the trials for pest and disease resistance which involve spraying a pathogen onto healthy plants may be harder to convince commercial growers to agree to. The first quarter of next year is shaping up to be a big one for the start-up when the outcome of a second commercial trial in Mexico for one of that country’s largest processed vegetable producers will be known, the one-year contract with its big Californian customer comes up for renewal, and new trials in Europe are hoping to be kicked off. The start-up’s funding is also due to run out in March next year and Bebb said they will do a further fundraising round early next year from existing and strategic investors. Though the amount has not yet been signed off by the board it will be above the $2 million raised last year. That round was supported by new and existing investors and major shareholders include the Manawatu Investment Group, NZ Venture Investment Fund, Stephen Tindall’s K1Wi investment vehicle, Ice Angels and Enterprise Angels. Wargent’s stake has been diluted to just under 10 percent. It has also had around $300,000 in research and development grants to date. Two Canterbury University mechatronics graduates, Taylor Howatson and Anthony Lefebvre-Allen, put all their study to good use, designing a small sensor for doors and windows. The sensors can alert a homeowner on their smartphone if they've left their house unlocked or if someone tries to get in, the catalyst coming when Mr Howatson's student flat was burgled. "There's a huge amount of emotional, not trauma, but emotional feelings that you go through when you're burgled," he told ONE News. "Forty per cent of burglaries in New Zealand are enabled through unlocked doors and windows," he said. The sensor designers had to convince a Vodafone panel that their idea deserved its support, and their idea was selected in the top 10 out of 170 applicants for Vodafone's accelerator programme Xone. "I think the potential's huge. I think every home in New Zealand would want to be connected, and I think everyone who has a home wants to prevent burglaries," said Matt Williams of Vodafone. The Wireless Guard designers have earned a mentoring package worth $150,000 and access to Vodafone's $50,000 innovation lab, that has just gone up in Christchurch, to test their product out. "There's no reason why New Zealand startups can't be the next Microsoft, the next Google, and so we're looking to help them do that," Mr Williams said. The designers certainly seem ready for the challenge, with Mr Lefebvre-Allen saying the ultimate goal is to see their device in every house. They hope to have the sensors on shop shelves next year. Seniors represent one are that holds particular promise in wearable, which remains to be an untapped market for tech companies. While just 13 percent of America’s population is 65 or older today, that slice will jump to 19 percent by 2030. According to analysts predict, medical applications will soon account for the largest share in the smart textile industry, reaching $843 million by 2021. Previously, smart textiles weren’t so wearable. Indeed, their metallic fibers were bulky and unattractive. But new futuristic threads—called “smart yarn”—allow designers to embroider circuits into fabric, making wearables lightweight, comfortable, and low-cost. Wearables that foster healthy and independent living will soon fill seniors’ wardrobes, too. With advances in nanotechnology, “smart clothes” that monitor seniors’ health and remind them to take their medications are on the way. Wearables empower patients to take control of their health and manage chronic illnesses. Chronic disease represents 86 percent of U.S. health spending. By some estimates, nine in 10 seniors have at least one chronic condition. Technology that helps seniors avoid complications from their conditions could yield tremendous savings by eliminating unnecessary hospital stays. Smart watches are already being used to alert patients to take medication. Soon, seniors with hypertension could use wrist-worn devices to track blood pressure, too. And seniors with diabetes may soon benefit from intelligent footwear. New Zealand startup Footfalls and Heartbeats and the University of Nottingham are developing sensor-equipped “smart socks” that warn diabetics when they are at risk for foot ulcers. For the 6 million seniors suffering from vision loss, mobility is often a nightmare. Sensors can change that. Designers are developing new sensors that emit ultrasound waves to detect objects that can be clipped to clothing or woven into vests. As the user approaches an obstacle, the sensor vibrates, growing in intensity and frequency the closer the obstacle gets. Tactile Navigation Tools’ Eyeronman vest employs three different types of sensors to guide users. The vest’s sensors communicate with an electronic textile shirt, which vibrates in a particular spot to indicate impending obstacles and their locations. According to government estimates, one in three seniors will suffer a fall each year, and one in five falls will result in a broken bone or head injury. Treating these falls costs $34 billion annually, and the problem will only become more prevalent as baby boomers age. If wearable technology can in fact help reduce the risk of falling, the benefits would be enormous. Washington-based Sensoria recently teamed up with Orthotics Holdings Inc. to develop a brace that uses flexible textile sensors to alert wearers when they are about to lose their balance. This week Australia's leading music streaming service, Spotify, has launched its biggest through-the-line campaign since entering the market in May 2012 , focused entirely around why summer in Australia is better with music. The mobile-first campaign, planned and bought by media agency Foundation, is running nationally across Digital, Social, and Out Of Home (OOH), and focuses on the three biggest music moments for Australian music fans; fitness, travel (commuting, road trips, and summer getaways), and partying with mates. The campaign has been informed by a data-led approach, mining a wealth of first party data to gain a superior understanding of what's driving platform engagement during these music moments, to determine how best to message the benefits of having Spotify as your summer music companion. The micro-targeted digital, social and mobile spend, is complemented by a programmatic buy, which utilises Google Display Network affinity segment targeting, as well as leveraging mobile location & behavioural data to create context-relevant geo-targeted ads. Says Serena Leith, marketing director APAC: "By leveraging the expertise of artists, influencers, and our own in-house music editors, this personalised , context-relevant campaign drives directly to content, as well as new product features such as Running, and Party, which we hope will drive significant increases in acquisition, active use, and all-important brand love over the Summer." Building on the success of Spotify's first foray into transit-focussed OOH in 2014, which saw the campaign awarded with OMA's Creation Collection Award for 'Best Creative Execution', Spotify has again focused on bright, eye-catching OOH creative, with simple copy sentiment, strategically placed in high-traffic transit environments. Snapchat will play a key role in driving organic conversion and user generated content around Party, Commute, and Fitness. Spotify has engaged NZ-startup Mish Guru to access their game-changing Snapchat content management platform, which has already helped grow "SpotifyAU" to over 4,000 followers in just over a month. Spotify, which launched in Australia in May 2012, has experienced unprecedented growth in the region, with one in three Australians having now tried the service. The "Summer is better with music" campaign runs until the end of February. Automatic SDK generator APImatic has released a free SDK search engine site, SDKs.io. Auckland-based Texus Fibre targets high-performance textiles for industrial applications such as breathing masks. Forget tales of Gen Y slackers; hard work, dogged determination and self-belief are themes that run deep through the stories of the young entrepreneurs interviewed for Your Business this week. Today, George Smith, from Glassjar. New Zealand angel investors are backing too few start-ups and should broaden their portfolios if they want to improve their chance of a return, according to Angel Association chairman Marcel van den Assum.